Made with mozzarella, Parmesan, garlic powder and butter, this delicious Pull-Apart Cheesy Bread is one of the KRAFT Kitchens favourite recipes. 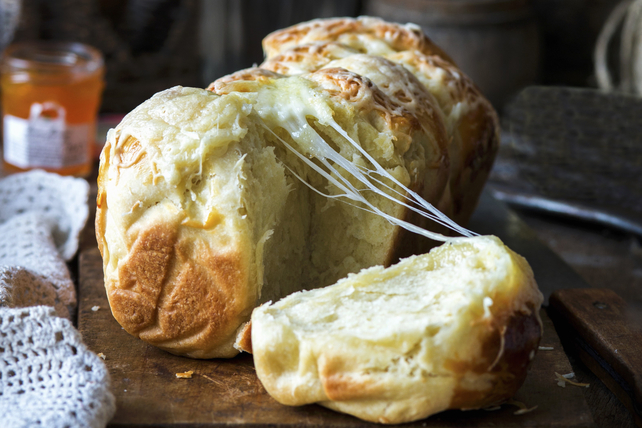 The refrigerated country biscuits help make this cheesy bread oh so easy to make. Once you start pulling away the gooey baked bread pieces, you won't be able to stop. Yummy good, this cheesy bread makes a great side dish or perfect appetizer. Spray 8x4-inch loaf pan with cooking spray. Mix butter and garlic powder in small bowl until blended. Dip half the biscuit dough pieces, 1 at a time, into butter mixture, turning to evenly coat both sides of each piece with butter mixture; place in prepared pan. Sprinkle with half the Parmesan, then half the mozzarella. Repeat all layers with remaining ingredients. Bake 23 to 27 min. or until golden brown. Run knife around sides of pan to loosen bread; cool 5 min. Remove bread from pan to heatproof platter. Serve warm. Substitute Cracker Barrel Shredded Old Cheddar Cheese for the mozzarella. Serve cheesy bread whole and let everyone serve themselves by pulling off their own bread pieces.